25th Year of Knowledge Bowl! 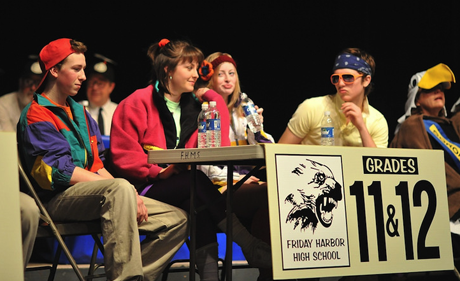 The 11th-12th Grade Team in action in the 2009 Knowledge Bowl – photo by James Krall. Are you ready for some knowledge? The San Juan Public Schools Foundation will host the 2019 Knowledge Bowl at the San Juan Community Theatre Monday evening, March 4, from 6:30 to 8:30. Doors open at 6:15. Tickets are $5 (or whatever you can afford) at the door. This is the 25th year of the Knowledge Bowl, and our silver anniversary promises to be a special evening! Teams from Friday Harbor High and Middle Schools and Spring Street International School will take on the Soroptimists, Lions, Kiwanis, and Rotary Club in a battle for intellectual supremacy hosted by Brent Snow. The High School Jazz Band will be on hand, as well as fabulous raffle prizes, crazy costumes, a large check, and more! It will be an evening of fun and laughter, so come join our celebration of 25 years of our island’s awesome brainpower!